Over Spring Break this year I watched “Good Morning, Vietnam” for the first time in a few years. It is famous for Robin William’s portrayal of Adrian Cronauer a radio DJ with the Armed Forces Radio Service who is sent to Saigon for work and quickly disrupt the strict status quo enforced by his commanding officers with his flippant humor and insistence on playing rock and roll on air. This kind of violence toward civilians during the war is something that is even now goes relatively unnoticed by the American public. The only well-publicized instance was the My Lai massacre but there are approximately seven other similar instances as well as many more attacks on individual civilians resulting in at least 50 more confirmed casualties. After investigations the accused rarely received appropriate sentences – or any at all – and even less often actually completed them. This kind of attention in popular media is significant as garnering attention from the public can influence people to take action. In this case it didn’t but, as we have seen with recent events in Baltimore, enough people acknowledging that something awful has occurred and standing up against those who would attempt to cover up or excuse it, people can make a difference in the path events take. When watching the clip of “All in the Family” in lecture today, I immediately drew connections to a show that has been on TV more recently, “Last Man Standing”. They both feature patriarchs from white, middle class families who possess fervently conservative political views. One thing that stuck out for me however is that, as Professor Putman pointed out, Archie Bunker’s political views were usually framed as narrow-minded and sometimes even offensive while Mike Baxter is usually (though not always) portrayed as being on the right side even when it is a bit over the top. It seems like rather than accidentally playing to the “unheard majority” like Archie did, Mike Baxter’s character purposely caters to the far right viewers who view themselves like the conservatives of the 70s. They fear their values are under attack by new liberal ideas and are searching for people – or characters – who share them. In lecture we discussed feminism in the 60s and 70s. When I go home and checked Facebook and was upset to see a post from a high school friend detailing two instances of sexual harassment that she had experienced today. It brought to mind that though we discussed a lot about misogyny at institutionalized levels, we didn’t really acknowledge the prominence of harassment both then and now. After discussing the Vietnam war in my small section group today, I went to a Film Society meeting where we discussed editing and some of its best uses in Film History. One of the examples we looked at was Apocalypse Now, directed by Francis Ford Coppola. In the opening sequence of the film two scenes are composited, one of the main character, obviously distressed, lying under his ceiling fan and the other of a helicopter flying past a line of trees just as bombs go off setting everything on fire. This film is considered one of the most influential war films in history because of how well it highlighted the horrors of Vietnam and war on a larger scale. This week in my TFM class, me professor brought up “The Birth of a Nation.” Professor Blum mentioned this movie previously in his lecture in regards to innovation and it being the first major motion picture. In our class we talked about the innovations of the director, D.W. Griffith and his innovations in editing techniques which allowed filmmakers to present their visions, even backward and racist ones, better than ever before. I was at a Film Society meeting today and out guest speaker was talking about some of the lighting equipment we have on campus. One of the items he emphasized was an HMI light. 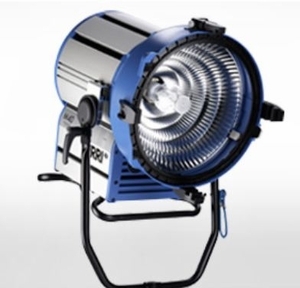 It is a light used in filming that consumes a comparatively lower amount of energy and emits less heat than many comparable lights, making them very useful on sets with limited power. It made me think of Blum’s lecture and his focus on the light bulb and its improvements over time as this is a light that has been improved and tweaked to suit a very specific purpose. Even though it has been a few weeks since we discussed being “haunted by history”, a conversation I was having with my grandmother reminded me of it. She and a few of my cousins do genealogy research fairly regularly and one of them had come across something unusual. 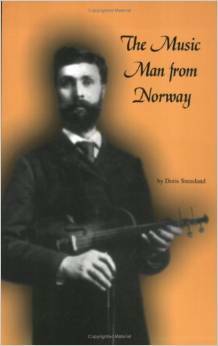 They had found a book written about my great grandfather, her father, written by someone completely unrelated to our family. Apparently, his career as a music professor was much better know than we had assumed and now he has been immortalized as a feature in the history of South Dakota.